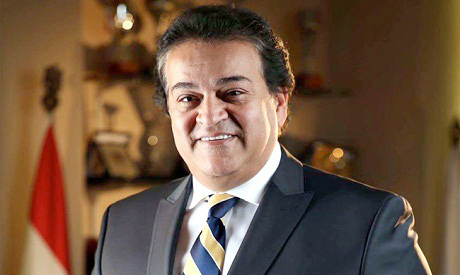 Egypt's Minister of Higher Education Khaled Abdel-Ghaffar decided on Tuesday to reduce the punishment of a male student who appeared in a viral video hugging a female friend on campus. The student’s punishment has been reduced from a two-year suspension to one term. Last week, a video went viral on social media showing a male student at Mansoura University surprising a female student, who studies at Al-Azhar University, with a bouquet of flowers and kneeling in front of her in what appears to be a marriage proposal. He then embraced the young woman and lifted her off the ground. The male student was originally suspended for two years following investigations by a disciplinary committee. The minister said that the decision to reduce the punishment comes in light of "the student's young age and his future." Abdel-Ghaffar called on universities to educate students on all bylaws as well as holding awareness sessions to avoid such incidents in the future. Meanwhile, Egypt’s Al-Azhar University overturned a decision to permanently expel the female student, hours after the Grand Imam of Al-Azhar Ahmed El-Tayyeb urged the university to reconsider its decision.